There's something really special about a photograph that was taken a long time ago, and has the scars to prove it ... fading and scratches and stains and flawed processing. It's the very definition of character, and its something that today's digital images and Photoshopping will never be able to match. Today's photo is a fine and evocative example. 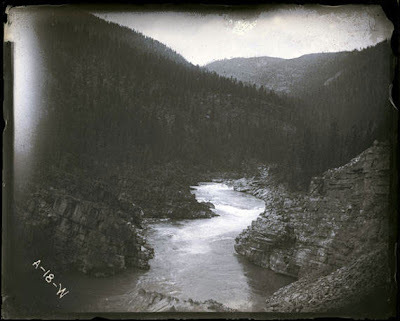 It's a shot of the Clark Fork River just outside of Thompson Falls, taken by a Missoulian named Chauncey Woodworth about 1908. I'm not sure of the exact spot where this image was taken, but much of the river near Thompson Falls is now entombed beneath a reservoir ... so tattered views like this may be all we have left of a very lovely spot. I bet that would have been an awesome view at the time that this picture doesn't do justice too. Wow. That looks like something out of a dream! I always wondered what it looked like before the Ft. Peck Dam covered most of the Missouri River Breaks. And this is going to sound sorta snooty, but I don't mean it that way...I think if a photographer can't get the picture to look right without Photoshop, all the computer manipulation in the world won't fix it. It's still not a bad view, NIck, even with the modern intrusions. But I really think that old photo captures a mood that just couldn't be replicated today. And yeah ... the Missouri River country! I would have LOVED to have seen it before it was drowned. Haven't even seen many photos ... but of course, that was before there was a more widespread appreciation of such things. As for photoshop, I see it as a tool in the same league with the darkroom tools photographers used a generation ago. But using it won't give you a good photographic eye, or turn you into a good photographer. And if you get carried away with photoshop, your pictures show it ... and it's not something that I approve of.